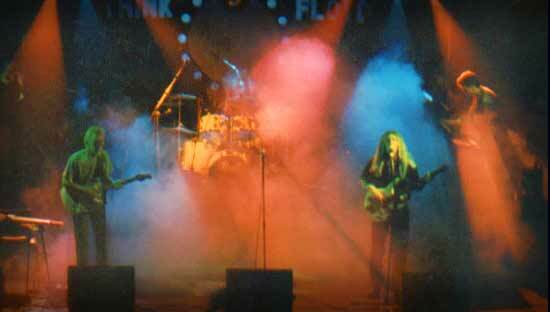 Think Floyd, the first Pink Floyd tribute band in the UK, were formed in South London, England in May 1994 by four talented and experienced musicians and songwriters. When they played "Comfortably Numb" for the first time in a pub in Forest Hill ithe audience response was amazing, they knew they had made the right decision. The band's popularity grew and they went on to perform at many major venues including the Royal Festival Hall in London, England . Their live repertoire has included the classic masterpieces from "Dark Side of The Moon", "Animals" and "The Wall" as well as old favourites such as Arnold Layne and Bike and more recent material from "The Division Bell". Many of the Think Floyd fans in the audience would say how they would love to hear new Floyd Music, and so the members of the band were inspired to write their own songs influenced by the writing of Roger Waters, David Gilmour, Rick Wright, Nick Mason and of course Syd Barrett. In 1997 the band decided that it was time to use their experience and musicianship to write their own original material and so set themselves apart from the standard tribute bands. As established and experienced songwriters with this was no problem and Think Floyd soon had their first album Hope completed. This was a successful move. Their own CDs Hope and Beyond Boundaries have received worldwide critical acclaim and have sold thousands of copies all over the world. The album Hope is available for download on many of the official MP3 download sites including iTunes and now H ope is available from Amazon. Think Floyd's 2nd album "Beyond Boundaries" got a great review from Michael Simone on the Roger Waters Fan Club website. As the number of tribute bands worldwide seem to grow every day we have now added pages on those bands that have now joined the Floyd Tribute Act bandwagon from all over the World. These bands have been been reviewed on the pages for Canada, Europe , UK , USA and Rest of the World Pink Floyd tribute bands. We now have a Pink Floyd News Section with news stories and reports .